Welcome to The Founders Club of Sarasota. The Founders Club offers 18 holes of exceptional golf on a well manicured championship course located on the outskirts of Sarasota Florida. The Founders Club golf course is spread out over 700 acres of lush green landscape, providing a balance of aesthetics and relaxing playing conditions. The Founders Club Clubhouse, AKA “Golf Hall” is a beautiful 24,000 square foot grandiose structure featuring a main dining room, private dining area for special occasions, bar and lounge area with a fireplace, outdoor dining area on the verandah also adorned with a fireplace, athletic center, men’s and ladies locker rooms and lounge areas, sports therapy room and a well provisioned Pro shop. The Founders Club golf course was designed by Robert Trent Jones Jr., and has the look and feel of a parks course. Wide open vistas with few hazards. Membership is equity based, all golf is “fee free” there is a one time Contribution of $25,000 and $1025 a month in membership dues and another $75 per month capital contribution fee. The club is also the only club with a traditional caddie program which allows you the pleasure of walking the course. It is also home to the endless golf lessons, $1200 a year for all the lessons you can handle. If you want to work on perfecting your game, The Founders Club is the place to do it. 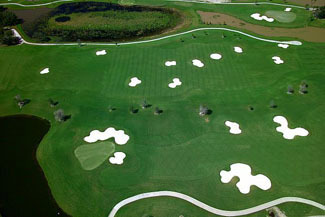 The founders Club golf course is a regulation length, 18 hole, par 72 course that measures 7,400 yards. The Founders golf course is one of those courses where there are no tee times. You just show up and play whenever you want, as many rounds as you want. Without any additional fees beyond dues. The whole premise behind Founders is freedom. This is your community, this is your golf course. The Founders Club Community is a world away. Once you enter the gates you leave society behind and enter one of the most exclusive golf communities in Florida. This is a quiet community where the pace slows to a snails crawl and you can relax and enjoy the life you have created. Only 262 homes will line the course and fill the community, currently London Bay Homes is doing the new home construction. 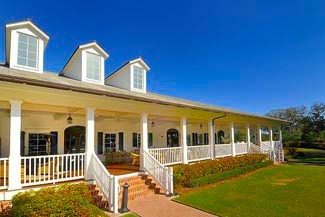 In 2008 and 2009 The Founders Club was named “Best Overall Community” in the Parade of Homes. It has also been in the top 100 three years running in Links magazine and Travel + Leisure Golf. It has also been voted “Best New Community” by Sarasota Herald-Tribune Readers Choice. Homes start around $900,000 and range in size from 3,000 square feet to over 8,000. Why use a broker as a Founders Club Buyers Agent? The Founders Club offers on-site real estate services and those agents represent the sellers best interests. If you are looking for the best price on a Founders Club home, you will need the services of a non-affiliated real estate broker that will negotiate the best deal for you as well as work for your best interest, not the sellers. Remember, the more a sellers agent sells a home for, the more they make. I want to get you the best deal so you decide to buy the property and use my services in the future. My negotiating skills have saved my clients hundreds of thousands of dollars which translates into a lot of free golf and drinks at the club house! Below are the current real estate listings available at The Founders Club. Please contact me if you would like view any of the Founders Club homes currently listed for sale.